The registered trademark ADAM is an acronym for "Advanced Data Access Methods". ADAM is primarily a run-time environment for commercial business I.T. applications, it provides the the key data processing facilities required by today's business enterprises. ADAM is fast, scalable, and its User Interface is both easy to learn and easy to operate. ADAM is robust and reliable and does not require I.T. specialist skills. ADAM was designed in the early 1970's and has been continuously developed and enhanced over the last four decades. The scope and capablities of ADAM in 2016 are orders of magnitude advanced from where ADAM started in 1973, that said, the present ADAM developers acknowledge and applaud the architecture and ideas of the team that created ADAM those many years ago, their work has more than stood the test of time. What is ADAM? 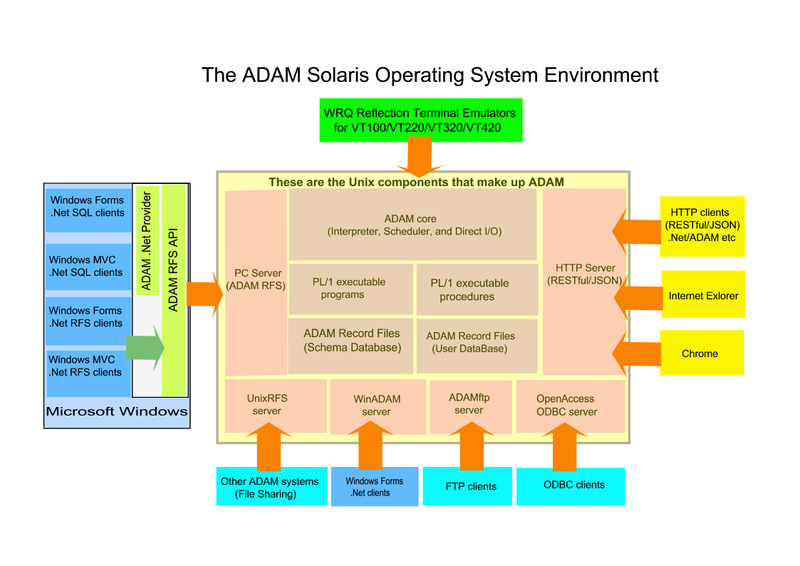 ADAM is a complete multi-user virtual memory operating system running on a true virtual machine architecture. ADAM executes its virtual machine using an interpretive order code, virtual memory, high-speed data management and a complete set of networking capabilities. The ADAM User Interface is technically a Command Line interface, implementing in full Digital's VT324 graphical terminal specification. The ADAM User Interface operates from any VT324 compliant emulator (Walker Ritchie Quinn's 'Reflection' emulator is widely used). Application development is based around the ADAM PL/1 programming language, a programming dialect of PL/1 optimised for commerical I.T. applications. ADAM implements a central control program, interactive debugging aids, comprehensive screen facilities, TCP/IP infrastructure, generalised data maintenance and reporting applications, production and development utilities, and more. Arguably the most powerful feature of ADAM is the ADAM Record Management System, it is fast, efficient of resources, totally scalable, and contains innovative data access techniques of which its original developers can be justly proud. User requirements, capabilities, and methods of commercial I.T. applications have all changed dramatically over the many years since Pat Shackleton, Ian Kelly, Tim Upton and others built the first ADAM, and the Internet has resulted in yet more changes to commercial I.T. ways and means. What has not changed is the need of business enterprises to store and retrieve the transactional information which is the life-blood of their commercial activities. For that need the ADAM Record Management System reliably delivers, it has delivered in the past, it delivers today, and it will continue to deliver into the future. To use the ADAM Record Management System over the TCP/IP network ADAM implements data schemas as a Data Repository. The continuous advances in telecommunications speed, computer processing power, and the availability of massive on-line hard disc storage capacity have inevitably led to "The Network is the Computer", as prophesised in the 1980’s by Sun Microsystems's Scott McNealy. Corporate data now resides on multiple heterogeneous networked nodes and business expects all data should be accessible from any location. The ADAM Data Repository working together with the ADAM Record Management System meets that challenge. Record oriented .Net clients (C#, VB.Net) using the ADAM.Net Provider libraries. The ADAM.Net Provider is fully integrated with MVC, RESTFUL, JSON, and other framework protocols.